Asthma can be a horrible disease. I don’t have asthma but a lot of people I know do. I can only imagine what it must be like to not be able to breathe. Patients I see often say that during a bad attack it feels like they are drowning. We admitted a lot of patients with asthma this week – it is one of the common reasons why young people need to come into hospital. Yesterday we saw Christine, age 26. She has been asthmatic since she was young. Her mother said that it started when she was less than 2 years old. She also had bad eczema – but that is not a problem now. Both Christine’s sisters and her father have asthma, but not bad enough to bring them into hospital. Her 2 year old daughter, Zoe has just started nursery and is getting a new cold every few weeks (normal 2 year olds get, on average, about 8 colds per year) and she is worried that Zoe is getting more wheezy with every one. Christine also caught a cold and just as her runny nose and sore throat were getting better, her breathing started to get worse and she could hardly speak as she was so breathless. At 4 in the morning her husband was really worried about her and called the ambulance. We’re not very close to understanding why some people get bad asthma. Genes are obviously important as it runs so strongly in families. Everyone thought that with rapid DNA sequencers we would have the answer long before now – surely we just have to look how the genetic code of those who suffer from asthma differs from those who do not and find the gene responsible? Of course, lots of scientists have been doing just that, but like many other inherited diseases such as hypertension and schizophrenia, we have found that it is not that easy. At least 100 different gene differences have been shown to be associated with asthma, not the two or three originally hoped for. Although I’m not an expert in this area, I don’t think we can say right now that the main genetic cause of asthma is x, y or z. A Sherriff et al: Association of Duration of Television Viewing in Early Childhood with the Subsequent Development of Asthma. Thorax 2009;64:321-325. Or perhaps Simon Cowell, or Barbie dolls? – probably not. The “hygiene hypothesis” is at least superficially attractive. Lack of exposure to nasty germs early in life means that when we are adult we respond to environmental allergens in a different way, provided we have a certain mix of genes. The fact that eosinophils (closely related to neutrophils I talked about two posts ago*) are found in large numbers in asthmatic lungs, and these cells are thought to be important in protecting us from worm infestation makes the idea that exposure to worms might protect us from asthma. 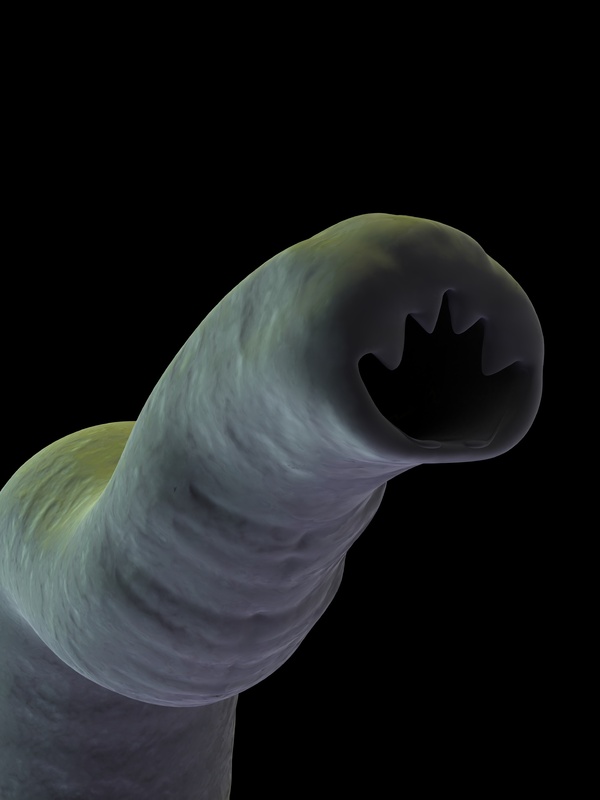 There is some evidence that that hookworm infection is protective. Hookworms are small and extremely ugly creatures which are common in some parts of the world – thankfully (?) not in the UK or US – although asthma is more common here than in third world countries. Wikipaedia says that 600million people worldwide are infected with this parasite. The way to get hookworm is to tread with bare feet on infected faecal matter. All medical articles about asthma mention these three things, which seem to keep the disease going in those who suffer from asthma. What links them? House dust mites are everywhere in houses. They are very small, again not particularly attractive creatures. They eat human skin flakes, of which there are plenty in house dust (we each produce and shed ¾ kilo of skin cells every year). Skin is made of keratin, a tough protein polymer which also makes nails and hair. 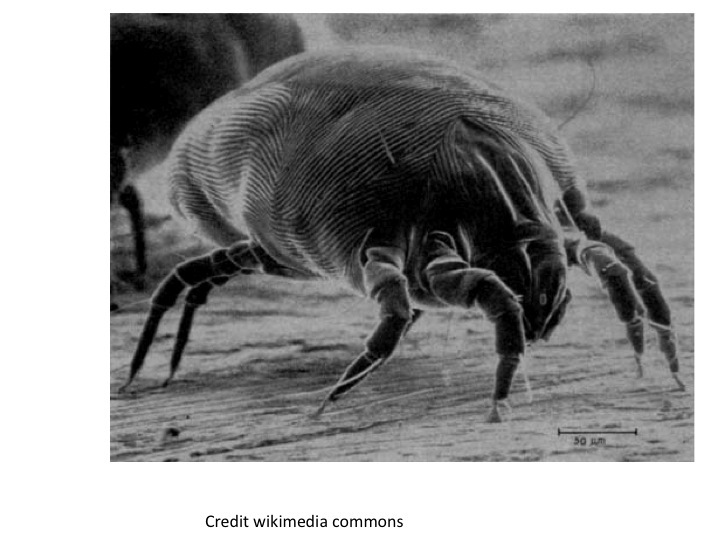 House dust mites love it. The problem is that they have only very tiny intestines and have problems breaking down the tough keratin. So what they do is soak the chewed-up skin flakes in digestive enzymes (one is called Der F 1), pack it into little balls, cover it in a thin membrane and then poo it out in a small (25 micron) faecal particle – about 20 each day. They then wander on their way and wait for the enzyme to do its work. When the faecal particle bag is nice and gooey, with the keratin dissolved, it will come back and eat it. Yum. This coprophagia (eating poo) is also seen in a surprising number of other creatures such as rabbits. Do not read the Wiki article on coprophagia. 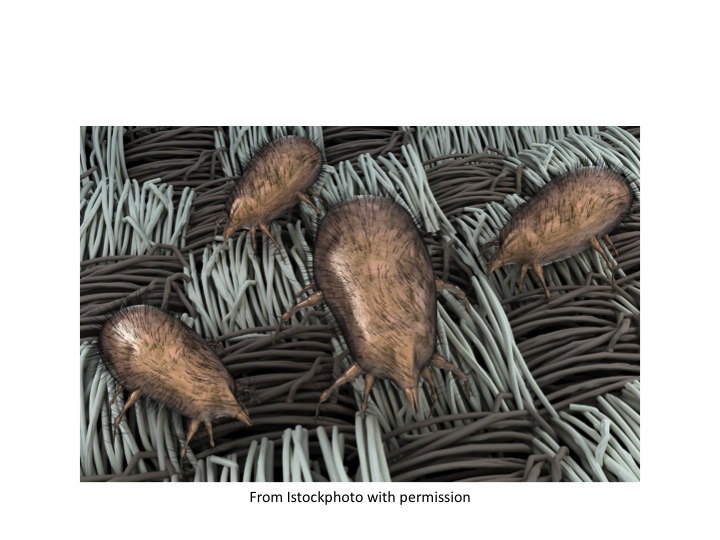 Because house dust mite faecal particles are so small, they stay airborne for a long time when sucked up by a vacuum cleaner and blown out into the room are easily inhaled deep into the lungs. Imagine now that you are one of the cells lining the surface of the lung – a bronchial epithelial cell. This poo-bag, the size of a large bacterium and heavily armed, lands on you. Fully tooled up with digestive enzymes threatening to dissolve you. I’m not surprised that you panic and call the police. The police come in the form of eosinophils, macrophages, basophils and lymphocytes when the alarm (interleukin 8 release, for example) is sounded. They arrive then throw their weight around, releasing all sorts of munitions like hypobromite, leukotrienes, histamine and a range of inflammatory cytokines. There is collateral damage. The effect of this activity is that the smooth muscle surrounding bronchi reacts to these chemicals by constricting. I don’t think anyone knows why bronchial smooth muscle does this – it hardly seems sensible or helpful. It certainly causes a lot of problems. At the same time there is swelling of the small airways because the inflammation caused by infiltration of these cells causes fluid to accumulate in the wall of the small bronchi, and on top of that there is more secretion of mucus than normal. All these things go together to reduce the size of the hole down the middle of the airways and make breathing difficult – asthma. As well as constricting in response to these inflammatory chemical signals, the bronchial smooth muscle becomes much more “twitchy” – constricting more than usual in response to cold air, exercise, smoke and other triggers such as viral infections. All these cause an imperceptible increase in constriction of airways in non-asthmatics. For people like Christine a simple head cold can mean several days in hospital, a stressed-out husband, a worried daughter, and two weeks off work for both parents. What about pollen? 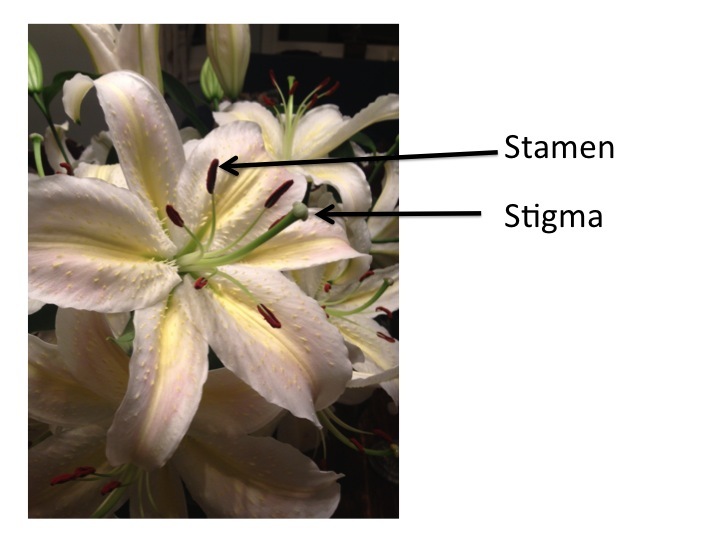 This is made by the male part of flowering plants – the stamens. When pollen lands on its lady partner (the stigma) that’s just like holding hands – it still has a lot of work to do before it can make babies. It has to burrow down into the gynaecium, using digestive enzymes, so that its male DNA can combine with female DNA. Again imagine the poor bronchial epithelial cell confronted with a randy pollen particle landing on top of it wanting to penetrate with its digestive enzymes – call the cops! Cat hair is also made of keratin. It is finer than dog’s hair and more likely to break up into small particles that can be inhaled. The story I’d like to tell you is that because cats lick themselves their hair is covered with saliva which contains digestive enzymes and therefore provoke a similar reaction from lung cells. I don’t think its quite so simple as that, for it seems that the allergen in cat hair is also produced from sebaceous glands as well as saliva– a protein known as Fel D 4. Nobody knows what this protein does. Clearly the bronchial epithelial cells of asthmatics are very frightened by it. Maybe it looks like Michael Gove. Platts-Mills T et al. Reduction of bronchial hyperreactivity during prolonged asthma avoidance. Lancet 1982(2) pp 675-678. Nobody has yet come up with a way to prevent asthmatics breathing in airborne allergens at the same time as living a normal life. So, although we give advice about allergen avoidance to our patients, the main effort is in reducing the amount of lung inflammation. 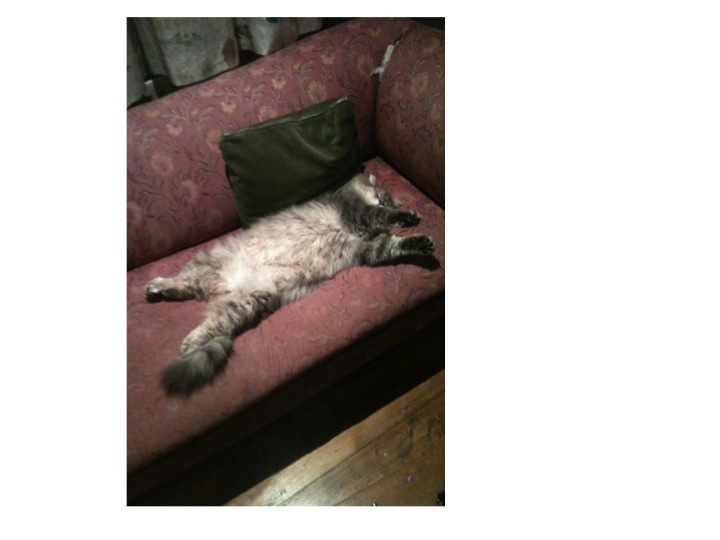 Christine is on a course of steroids (prednisolone), which is quite effective, but it takes a few days to work and concerns her, because of its long-term side effects. 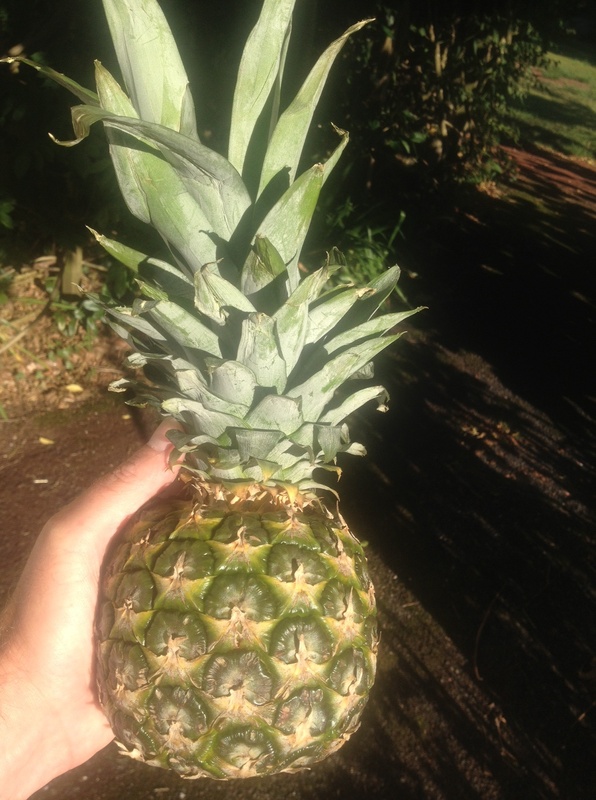 The food link this week is pineapple. Pineapple contains a digestive enzyme called bromelain, a cysteine protease with the same function to break down protein as the digestive enzyme in house dust mite intestine. Uncooked figs and papaya also have a similar proteolytic enzyme. This means if you try to make jelly (Jell-O in the US) with pineapple it will not set because it breaks down the gelatin protein and stops it working. You can use fresh (not canned) pineapple juice as a marinade to make meat more tender – be careful, or the meat will end up as a sloppy mush. *eosinophils also have a peroxidase like neutrophils, but eosinophil peroxidase preferentially combines hydrogen peroxide with bromide, to produce hypobromite, which is presumably more effective in killing worms than hypochlorite. Back in 1987 when I was an MSc student in London, I helped as a volunteer for an asthma research project at the Brompton hospital. I inhaled leukotrieneB4 to initiate an attack & it felt like I could only take quater of a breath in – I went to take a normal breath & it stopped before my lungs were full – glad it was fully controlled. They then gave me mustard powder to inhale as the coughing may help relieve the attack. I turned out to be one of the one in a hundred people not sensitive to mustard powder, but all was well. Loved the article on Asthma. My son grew out of it. As a nipper (we’re Australian) he used to wheeze when he was stressed, either through physical exertion or through anxiety. These days, 25 years later, he’s more likely to have a hard-to-shift cold than some of his friends but (touch wood) seems to be free of the asthma proper. On the other hand, I hear of older people developing late-onset asthma. I’m not sure you said much about the susceptibility of different people at different ages, or even the same people at different ages. Are there any credible theories for this perceived waxing and waning of asthma-susceptibility over an individual’s lifecycle? Thanks for the blog: it’s great! I think we first need to find out why young people get asthma. Then we may be able to work out why it gets better in most of them as they get older and only starts in some when they are adult. I think we will find that there are multiple genes responsible, this combined with a multitude of environmental allergens will make a complicated picture. I do think it can be worked out, but we’re a long way off at the moment.